Students will be able to develop and use a model to understand the characteristics of the different layers of the Earth's Atmosphere. 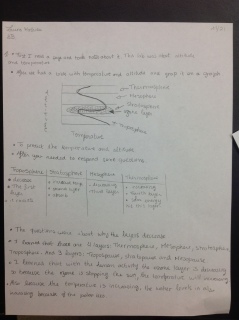 Help students visualize the differences in temperature in Earth's atmosphere by having them create a model while practicing graphing skills. 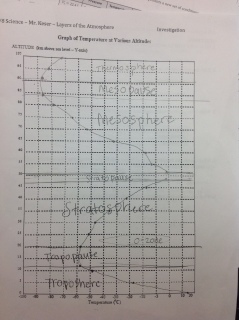 In the lesson, students investigate the differences in temperate of Earth’s atmosphere by creating a graph of the layers of the atmosphere and labeling each layer. The atmosphere can be divided into five layers based on temperature variations. The layer closest to the Earth is called the troposphere. Above this layer is the stratosphere, followed by the mesosphere, thermosphere and exosphere. The upper boundaries between these layers are known as the tropopause, the stratopause, and the mesopause, respectively. Temperature variations in the layers are due to the way solar energy is absorbed as it moves downward through the atmosphere. The Earth’s surface is the primary absorber of solar energy. Some of this energy is reradiated by the Earth as heat, which warms the overlying troposphere. The global average temperature in the troposphere rapidly decreases with altitude until the tropopause, the boundary between the troposphere and the stratosphere. The temperature begins to increase with altitude in the stratosphere. This warming is caused by a form of oxygen called ozone (O3) absorbing ultraviolet radiation from the sun. Ozone protects us from most of the sun’s ultraviolet radiation, which can cause cancer, genetic mutations, and sunburn. Scientists are concerned that human activity is contributing to a decrease in stratospheric ozone. Nitric oxide, which is the exhaust of high- flying jets, and chlorofluorocarbons (CFCs), which are used as refrigerants, may contribute to ozone depletion. At the stratopause, the temperature stops increasing with altitude. The overlying mesosphere does not absorb solar radiation, so the temperature decreases with altitude. At the mesopause, the temperature begins to increase with altitude, and this trend continues in the thermosphere. Here solar radiation first hits the Earth’s atmosphere and heats it. Because the atmosphere is so thin, a thermometer cannot measure the temperature accurately and special instruments are needed. Laptops/Computers with Microsoft Office or printed data sets for each student. 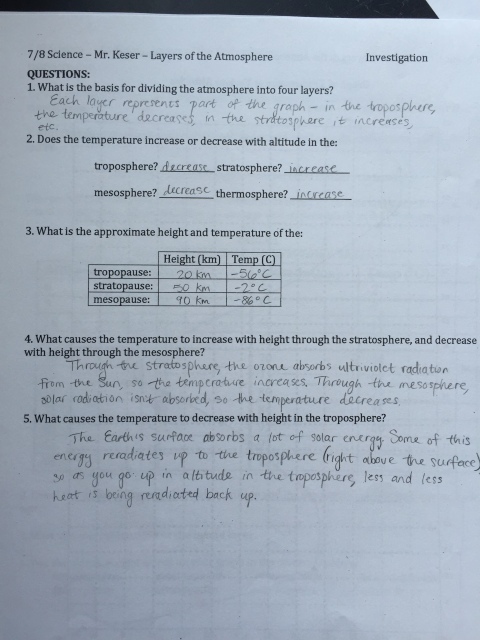 Begin by asking students to think about Earth’s atmosphere and create a line graph in their journals that shows how the temperature of the mix of gasses in the atmosphere change as you move from the surface of the Earth towards the edge of space. 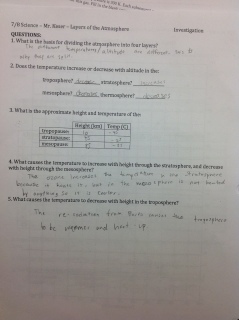 Ask them to plot it as Altitude over Temperature graph. (Practice 4 Analyzing and Interpreting Data) They do not need to worry about units, just the shape of the line. I have a class set of small white boards and markers and have had students create the graphs and hold them up, this way everyone sees each other's ideas. If your 8th graders are not familiar with how to create a line graph, model for them first by creating an XY plot and then add a line. This elicit is open ended, and meant to serve as a indicator to you of what the students think. Most will create a straight line that either shows a decrease or increase in temperature. In this video, I explain my rationale for using this strategy and capture some of the students at work (Classroom Video: Visible Thinking - Making Predictions). Ask students to share their results with their lab group (3-4 students). They should each share their graph and defend their ideas. (Practice 7 Engaging in Argument from Evidence) Ask them to try and reach consensus as a group on their understanding. It is o.k. to disagree. I use this type of protocol often in my class and enjoy walking around and listening in to the talks. I try to capture snippets of discussion to share back to class after they have shared out. This is helpful to focus what "we" think as a class prior to starting the lab or investigation. Once completed I can then discuss with them...."You thought this.....Now you think this.....Why? What changed? It is good practice at the start of the school year to model and practice how to have these table talks as we use them frequently. One strategy you might try is to give students sentence starters to help them provide warm and cool feedback to one another. Here are a list of accountable language stems that can be copied and distributed to your students and kept in their binders for quick reference. Ask them to take these out and use them during their talks. The goal being that their are internalized and used without prompting. Bring the class back together and ask for one person from each group to summarize their table’s ideas. I ask students to come to the whiteboard, draw their graphs and give a short explanation of their thinking. Summarize the different ideas of the class without giving the correct answer. Students often want to the "right" answer right away. Teach them to learn to be accepting with not knowing and allow them to discover the science through exploration. Now that you have a picture of what they think, your students will now explore a general model of the layers. First, they will read through some background material and flush out the central ideas in each section to create a summary that is separate from their prior knowledge. Key words are in bold to assist them. These notes will then be used to help them reason through labeling the graph with each layer. Take a minute to review this video (Classroom Video: Visible Thinking - Identifying Key Points) to see this strategy in action. 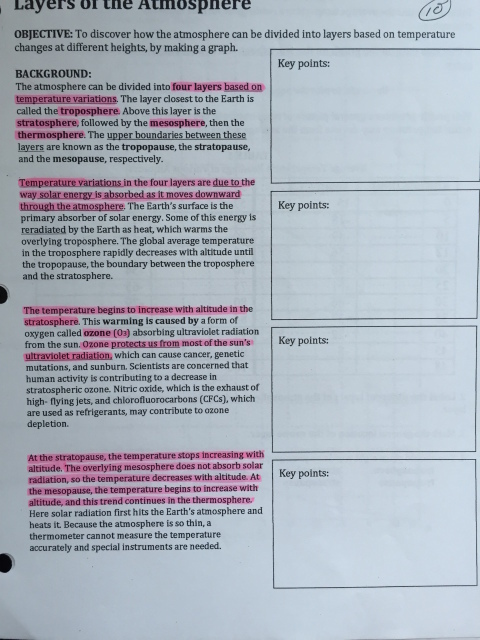 Distribute the Layers of the Atmosphere student handout, placing students in small groups. 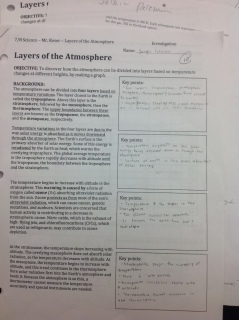 They are expected to graph and label the layers of the atmosphere and answer the follow up questions. If you prefer, after they are finished reading the first page and summarizing the key points, you could stop and gather the class back together to discuss what they read and how it may differ from their initial ideas about the layering of Earth's atmosphere. To have students explain what they have learned you can have them complete an activity titled "Explain to Edward". Edward is a fictitious member of the class who was absent for this activity the students must summarize for him what was completed and what they learned. You may opt to have students complete this individually or as a small group. A sample script is below. One of our students, “Edward”, was absent for this activity and asks you to summarize the lesson for him. Please address each of Edward’s questions. Summarize the activity me (bullet points are fine). What questions did we try to answer? Anything else you think I should know. 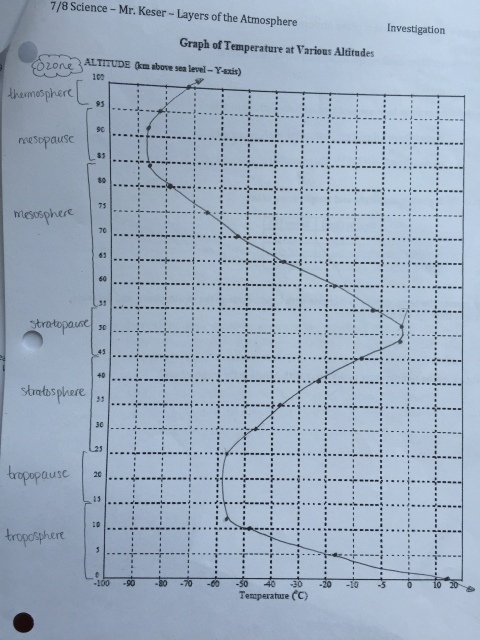 Students should be graded on the correct plotting of the points in the table onto the graph (pages 3 & 4 of Layers of the Atmosphere). They should also label eight items on the graph: troposphere, tropopause, stratosphere, stratopause, mesosphere, mesopause, thermosphere and ozone layer. You may also decide to grade the "Explain to Edward" prompt as part of the assessment. You'd be looking for use of science vocabulary as well as content. Time permitting, you can show students the following YouTube video clip taken from the 2007 BBC show Earth. It does an excellent job summarizing and showing the layers of the atmosphere. Alternatively you may elect to assign the viewing for homework.